The Brother XR9500PRW sewing machine has a sweeping array of features for both practical and decorative purposes. 100 built-in stitches, including 55 alphanumeric stitches, give you endless options for clothing construction, quilting, crafting, and more. Don’t let the low price tag fool you--the XR9500PRW is an advanced, well-made machine. 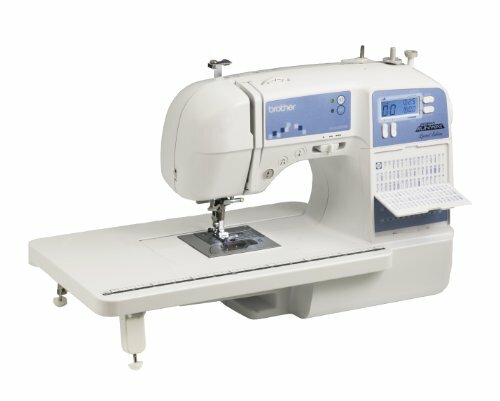 With an enormous selection of 100 unique stitches, the Brother XR9500PRW is a fantastic machine for decorating, adding embellishments, and quilting. The 100-stitch selection includes decorative, utility, and heirloom stitches for complete versatility. The stitch options are all clearly printed on a space-saving flip-stitch guide. This guide is built into the machine; refer to it for the number that corresponds to your desired stitch, then select that number with the computerized stitch selection feature. With 55 built-in alphanumeric stitches, you even have the option to monogram your sewing projects using this machine. These stitches allow you to personalize clothing and accessories, or even to create meaningful gifts. The XR9500PRW machine has 8 variations of 1-step auto-size buttonholes. 1-step buttonholes are exceptionally convenient, and with 8 different buttonhole stitches, you can create the perfect hole for any type of button. Each of the 100 built-in stitches has multiple stitch functions, allowing you to find the perfect setting for just about any project. In total, this machine offers 140 different stitch functions! Most machines offer a maximum stitch length of 4mm and a maximum width of 5mm. To expand your creative options, the XR9500PRW has a maximum length of 5mm and a maximum width of 7mm for zigzag and decorative stitches. Easy bobbin winding and drop-in bobbin: This machine uses an independent bobbin winding motor to make filling the bobbin easy. Plus, the drop-in bobbin system helps you load the bobbin quickly, with no confusion or frustration. Free arm: A built-in free arm is a fantastic convenience for sewing various parts on garments, such as cuffs, collars, and pant leg hems. Needle position button: This machine conveniently allows you to stop sewing with the needle down so you can pick up right where you left off. Use the needle position button to raise or lower the needle. Needle threading system: The XR9500PRW does the work of threading the needle for you with an automatic needle threader. This feature saves a lot of time and is excellent for beginners. LED-lit work area: View even your most detailed projects with clarity by using the built-in LED bulb to illuminate the workspace. Back-lit LED screen: The built-in LED screen allows for simple, digital stitch selection. You can also use the screen to adjust your stitch measurements. Extra-wide table: Quilts, long dresses, and other large projects require a more expansive workspace than most machines provide. The XR9500PRW includes a built-in oversized table to easily accommodate these projects. What Accessories Come With the Brother XR9500PRW? The Brother XR9500PRW machine comes with a range of user-friendly accessories, including both sewing feet and basic sewing tools. The ample number of included accessory feet listed below are very useful for clothing projects in particular, but will come in handy for all sorts of tasks. These included accessories are easily accessible in a compartment that’s built into the arm of the machine. This keeps all of your tools within reach and helps you avoid misplacing anything. In addition, the XR9500PRW comes with a handy hard cover for protection while it’s not in use. You can use the hard cover for safely storing the machine. With your purchase of this machine, Brother includes a 25-year limited warranty. This gives you peace of mind in knowing that if any issues arise with your machine, Brother will be committed to making the problem right. The Brother XR9500PRW includes a large collection of built-in stitches and a broad range of length and width options so you can truly make each project your own. It’s a wonderful machine for decorating and adding personal touches to projects. This machine is highly affordable despite the many advanced features it offers. It includes a far larger range of stitches and accessories than many other machines in the same price range. Features including the automatic needle threader, drop-in bobbin, and needle position button make operating this machine simple--it’s a great choice for beginners and people learning to sew for the first time. The XR9500PRW sewing machine weighs less than 10 pounds. This is exceptionally light for any sewing machine, but especially for one that includes such a large collection of features. This Brother machine is constructed mainly from plastic, making it less durable than other available machines. The XR9500PRW is not the best machine for handling thick or heavy materials like upholstery fabrics or denim. This sewing machine doesn’t have an automatic thread cutter which, while not a necessity, is a convenient feature that many competing machines include. 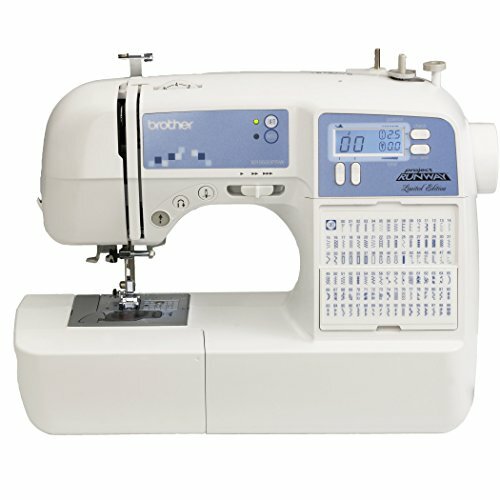 Whether you’re looking to add some extra flair to your homemade garments or just for an affordable machine to start off your sewing hobby, you should consider the Brother XR9500PRW. A generous selection of stitches, several convenient features, and an assortment of included accessories make this machine a top choice for sewers of all types. Take your creativity to the next level with the XR9500PRW machine.